That is about the cutest thing ever. Great shot. OMG! This is so adorable and she's a Jack Russell. Double kudos. Congratulations on a fine win!! really dont know what to comment here, the photo just draws me in so much with its simplicity but strong emotional feel. Really like it. You've captured the comfort of security, togetherness and cuteness all in one cup.Your cup must runneth over!! LOL!!! Message edited by author 2004-01-28 18:34:56. Great shot and a very cute dog, but kitty for a name? I hope he doesn't get a complex! LOL Congrats! Welcome back Connie! Weren't you in the hospital? Good to see you come back with such a wonderful shot! Congrats! Wonderful. Now that's a keeper. And I am sure you could find some calendar/card makers who would like it as well! Very nice photo, sharp and so detail. You should print an 8x10 and frame it in some room of your house with a nice matte and frame. As this puppy grows older you'll always get a smile and feel good remembering those puppy months. I have puppy picks in my house and although I see them everyday; some days I really feel great seeing my 'babies' as pups. This photo is a treasure. Your others are as well. Congrats. You have the touch... Keep up your great work. man, i cant help but smile everytime i see this little face! :) congrats connie--you rock! Message edited by author 2003-08-18 11:55:18. Wonderful and very creative shot. congrats!!! Owwww!! This one is giving me a toothache, it's so sweet! Wonder what it would look like in black and white. Be sure to put this one on DPCPrints! Congrats on a well executed photo that delivers emotion as well. Congratulations Connie, that puppy is so cute! Way to go! A well-earned ribbon indeed. I really liked your image and even picked it as one of my top three for the week. But, my wife and I wondered if the dog would really go into the jug on his own or was coaxed to enter by the photographer. Your statement provided with the image seems to indicate that the puppy does this on his own. Very interesting and strange. Cats tend to do this sort of thing, but I have not seen a dog do it that often. It is a great shot and I am very pleased to see you do so well. I made this shot my wallpaper when I voted. Great!!!!!!!!!!!!!! You are my Wallpaper of the week. Awesome shot!!! And she's named Kitty??? That's just....well TooCool!!! Message edited by author 2003-08-18 00:56:05. Wow that's a Jack Russel? I was sure it was a Boston Terrier. Congrats on the win! Oh, I didn't get to vote but this is a great shot! Her name is Kitty! Amazing shot and gongratulations on another well deserved ribbon! Great..one of my favs. Congrats!! This is one of the cutest photographs I have seen in a long time. I like the depth of field, but the cuteness is what really strikes me. Comment only - no vote. How adorable. I think this will be a ribbon picture. Grass might be just a little oversaturated. It doesn't really hurt anything though. Actually it might make for a little better contrast. Unbelievably adorable! This is a shot worthy of being a poster! Whether set-up or "accidental", this shot is fabulous. Everything (lighting, composition, subject) works well together and draws the eye right in to that puppy's face. Destined to be a fav for many, I am sure. This is so frighteningly adorable that I don't have words for it. I hope that container is as large, and the animal as comfortable, as it looks. Such a darling little peeping face. I also like that there's not much glare here, and yet the shadowed areas can still be made out fairly clearly, where they're in focus. What a terrific shot. Now how did you get this little one to cooperate so well? He looks very comfortable in there. Perfect entry for the challenge! This is so cute. It is amazing how you got the little dog into the jug and to stay there. The green grass and the black and white of the dog and jug work well together. THe DOF is spot on and enhances your image even more. I first gave this a 9 but bumping to a 10 now - Gary. Perfect lighting, great job. Too bad that blade of grass (on the left) is there but not a big deal. 8. Wonderful shot! I love the composition. Everything works in this photo. The puppy is adorable and I just love the expression on his face. 10!! Lol. Very cute composition. I love the colors and the DOF. a definite 10 from me (that's saying a lot 'cause I'm a cat person). Jacko. Cute Shot! did the doggy get out of that thing?? awwww...you cot me. that's way too cute. And I like the out of focus foreground. the framing of the shot is nice too, the green grass contrasts well. Good DOF and interesting subject. The top of the cup/pitcher is a bit too bright relative to the lighting on the inside and the dog. I simply adore this photo...very nicely done. My fav for the week. A very appealing photograph. Certainly fits the challenge...good composition, focus and lighting. This is a high number vote. Great colors, and you definitely got the cute factor going. Good work. What a great subject! Your composition and exposure are excellent. the only thing I don't like is the tall blade of grass on the left. Niecely done and I give it a 9 (10 without the grass blade). I love this shot! Did the puppy climb in all on his own? It's so sweet. He looks like he is saying, "Comfort me. I want my mommy!" Precious. Technical aspects of photo are great too. I like how the black and white of the puppy and container contrast with the grass. Nice DOF. He looks like he's hiding... very touching. OH MY GOSH. This picture made me squeal, which frightened my poor kittens. 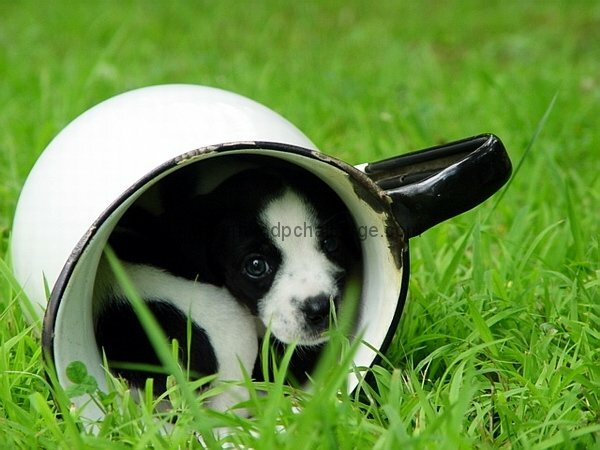 Cuteness has curled itself into a metal cup. Stunningly adorable!! He must be tiny! This is too cute for words. This is absolutely precious !!! Great composition, clour is nice, great candid photo. The only suggestion I would have is to include more space of green above the can. My personal favourite ! Soo cute! And I don't normally go for the cute shots! I like the off-centred composition but feel it could be improved further by cropping just a little less tightly at the left and bottom edges - the edge of the mug feels too crowded within the frame. That said it's still very strong as it is and the eye contact is great! Oh how cute is this! My kids would love one of these little guys, is it what they call a teacup dog? nice composition,dog is little out of focus because of shallow DOF and white part of the cup too bright ,7 from me! How do you like ribbons? Any color preference? Amazing shot and I just love it. fulfills the challenge and is terminally cute--what kind of puppy is it? This wins the award for the cutest thing I think I've ever seen on DPC. If this doesn't win a ribbon, I'm a complete fool! Very funny :) Great catch! This is a great image. What a capture. Proudly hosted by Sargasso Networks. Current Server Time: 04/18/2019 06:22:34 PM EDT.